An inappropriate balance of nutrients makes goat's milk a poor substitute for infant formula. Goat's milk formula compensates for the nutritional differences by diluting the rich milk and adding missing vitamins and iron. A child's sensitivity to compounds in cow's milk formulas could make the change to goat's milk formula worthwhile. Goat's milk formula digests easily and contains fewer irritating proteins. Neither goat's milk nor cow's milk replaces breast milk or infant formula. Children under one year old need an approved infant formula if not breast-fed. Milk from different species of mammals varies widely in nutritional content. 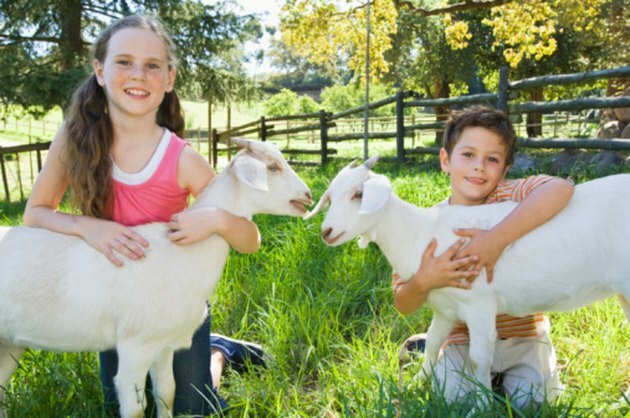 The dietary needs of baby cows and goats differ from the needs of human infants. Substituting animal milk for human milk can cause serious problems. Modern infant formula adds iron and vitamin D -- which even breast-fed infants often lack -- and guarantees the correct balance of nutrients for the first year of life. Goat's milk formula adjusts the nutritional value of goat's milk to meet human needs. Like other dairy products, whole goat's milk should only enter the child's diet after one year, when introducing whole foods eases the dependency on breast milk or formula. Goat's milk formula may replace cow's milk formula when infants show sensitivity to that product. Children may find goat's milk formula easier to digest since it contains no agglutinin -- the compound in cow's milk that causes fat to clump together. Smaller fat particles and softer curds of protein in goat's milk formula reduce problems with regurgitation in young children. Goat's milk formula provides more selenium, niacin and vitamin A than cow's milk formula. Goat's milk formula contains only traces of one type of casein, a protein that often causes milk allergy in humans. Shifting from cow's milk formula to goat's milk formula in search of a solution to lactose intolerance or milk allergy may not solve these problems. Goat's milk formula contains some of the same proteins that cause allergic reactions to cow's milk although the risk does drop. Goat's milk contains only slightly less lactose and could still trigger lactose intolerance in sensitive people. Goat's milk also lacks important nutrients cow's milk does provide. Unless fortified to replace these missing nutrients, goat's milk formula won't meet an infant's needs. Goat's milk offers 1/5th the amount of Vitamin B12 and 1/10th the folic acid of cow's milk. Eight ounces of goat's milk provides only 1 mcg of folic acid, and diluted goat's milk in formula provides even less. Children need 75 to 100 mcg daily. Many commercial brands of goat's milk add extra folic acid to increase the milk's nutritional value. In some cases, infants intolerant of formulas based on soy or cow's milk might benefit from a goat's milk formula alternative. However, the United Kingdom's Department of Health deems goat's milk formula unsuitable for infants and does not approve goat's milk formulas for use. Always consult a qualified pediatrician before making the shift, and supplement the formula as the doctor directs, to compensate for its nutritional deficiencies. Goat's milk formula recipes dilute the mineral and fat content with plain water, and add carbohydrates in the form of rice syrup, corn syrup or sugar. If your pediatrician approves the switch to goat's milk formula, you'll probably need to make your own. In the U.S., goat's milk is available from local farmers and as a canned commercial product. Some commercial brands may be labeled as fortified and already contain extra nutrients. Diluted goat's milk and rice syrup provide the basis for homemade goat's milk formula recommended by AskDrSears.com. Goat's milk contains high levels of calcium and potassium, which exceed the needs of a human infant. Diluting the milk reduces the mineral load on an infant's kidneys, and daily multivitamins prescribed by a physician -- including an iron supplement -- correct other nutritional deficiencies. Avoid goat's milk containing Bovine Growth Hormone or antibiotics. One serving of homemade goat's milk formula contains the same number of calories as cow's milk formula. Baylor College of Medicine: Is Goat Milk a Good Substitute for a 9-Month-Old Who Can No Longer Breastfeed? How Much Iodine Is in Milk?